Calvin Coolidge's widely-publicized adoption into the Sioux tribe, 1927. Photo courtesy of Associated Press. During the summer of 1927, Calvin Coolidge, 30th president of the United States, was formally adopted into the Lakota nation. The ceremonies took place in Deadwood, South Dakota, with the prominent Sicangu Lakota activist and teacher Chauncy Yellow Robe presiding. Yellow Robe’s daughter placed an eagle feather headdress, a potent symbol of Lakota culture, on Coolidge’s head. The tribe also gave Coolidge a Lakota name—Wanblí Tokáhe, or “Leading Eagle”—signifying his welcome into the Lakota nation. To the Lakota, the adoption was an assertion of their survival as a Native nation that desired equal footing with the United States. But that complicated notion was lost on most Americans, including the president himself, as well as the people who witnessed breathless coverage of the adoption ceremony in the press. That summer Coolidge spent several months in Lakota Sioux territory. He vacationed at his “Summer White House” in South Dakota’s Custer State Park, visited an off-reservation Indian boarding school run by the federal government, met with tribal leaders who presented him with serious concerns about U.S. policies toward Indians, and became the first sitting U.S. president to make an official visit to an American Indian reservation—Pine Ridge, home to the Oglala Lakota. Throughout all of his interactions with Native people, however, Coolidge would cling fast to an outmoded and misguided 19th-century mindset: The conviction that Indians could only improve their lot by assimilating into U.S. culture, and that it was the federal government’s responsibility to make that happen. It was a paternalistic policy that would soon begin to be upended, thanks to the efforts of a new generation of Indian rights activists like Yellow Robe, and their allies. But Coolidge missed the message these activists tried to bring him during the summer of 1927—and, indeed, throughout his presidency—to become a holdout who, despite good intentions, thwarted and delayed efforts to improve life for millions of Native Americans. The years that Coolidge was in the Oval Office, 1923 to 1929, marked a period of remarkable advances for the United States. Rapid popularization of technologies such as the airplane, motion pictures, the refrigerator, the telephone, and radio transformed many Americans’ everyday habits and coincided with rises in employment and wages that led to a yet another new 20th-century American phenomenon: mass consumerism. But the “Coolidge Prosperity” never reached federally-administered American Indian reservations, where people lived in stark poverty, without adequate housing, food, clean water, or sewage disposal. Infectious illnesses, including tuberculosis and the eye disease trachoma, were widespread. In principle, federal policy aimed to reverse these woes, but in fact it was the source of most of the challenges plaguing Native Americans. The U.S. contributed to poverty and disease by forbidding American Indians to follow their traditional ways, by making them dependent on inadequate government health and other services, and by imposing a way of life that (inadvertently) marginalized them economically. The government mandated that Native children attend schools—preferably off-reservation federal boarding schools—where educators punished them for speaking their Native languages, and made systematic attempts to erase every aspect of their tribal culture and identity. Authorities outlawed some traditional religious practices, most notably the sun dance, and undermined Native leadership and governance in the name of an assimilationist ideal, breaking down tribal cohesion. Calvin Coolidge meets Ruth Muskrat on December 12, 1923. Photo courtesy of Library of Congress. Early 20th-century Indian rights activists, like Yellow Robe, sought serious dialogue with U.S. government officials to reverse this paternalism, which had defined U.S.-Indian relations for nearly a century. The Native leaders, intellectuals who had been educated in government schools and spoke flawless English, came from various tribal backgrounds. Radicalized by the abject poverty on reservations, as well as the government’s autocratic approach and refusal to live up to treaty agreements, they worked together in an early example of “pan-Indianism” to advocate for their people. Native activists founded the Society of American Indians, the first national all-Indian organization advocating for Indian rights. Later, many served on the Advisory Council on Indian Affairs, also known as the Committee of One Hundred, a group with Native and non-Native membership assembled in 1923 by Coolidge’s Secretary of the Interior, Hubert Work. They championed many goals: ending numerous abuses by U.S. Indian agents; gaining restitution of tribal lands, control of natural resources on those lands, and respect for treaty rights; extending U.S. citizenship to all Indians; and protecting religious freedom. Coolidge was not unfamiliar with their efforts. At his Lakota adoption, he had been welcomed by tribal leader Henry Standing Bear (who, with Chauncy Yellow Robe, had been a founding member of the Society for American Indians.) The president also knew of Charles A. Eastman—a Santee Dakota writer and physician—well enough to support his appointment as U.S. Indian Inspector, the official responsible for conditions on reservations. In December 1923, the president met with 66 members of the Committee of One Hundred—presumably to acknowledge the importance of their work—and posed for pictures with them on the White House lawn. One photograph taken that day shows Coolidge with Ruth Muskrat, a Cherokee student and activist at Mount Holyoke College, and Rev. Sherman Coolidge (no relation), an Arapaho educator who lectured widely on Indian issues. Muskrat presents the president with a copy of The Red Man in the United States, a 1919 book that helped bring attention to American Indian poverty and health and education disparities. In a speech, Muskrat appealed to Coolidge for schools that could lead Indians “back to their rightful heritage of nobility and greatness.” Afterwards, she joined Coolidge and his wife for lunch. 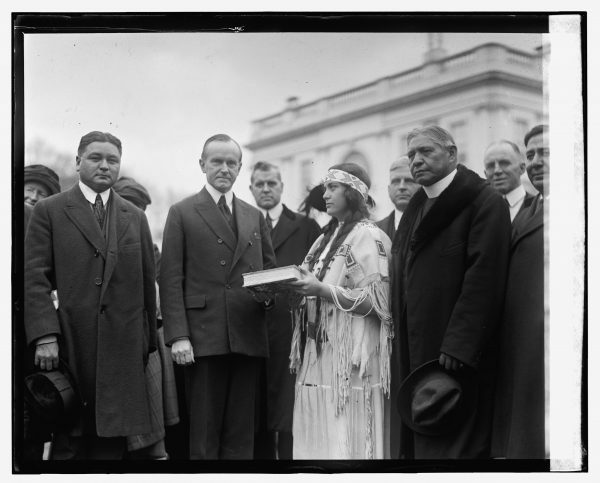 Coolidge vetoed legislation that would have allowed tribes to file suits in the U.S. Court of Claims, a crucial priority for Indian rights activists and tribal leaders. And he is most severely criticized for not halting the continued implementation of the devastating General Allotment Act of 1887. Intended to integrate Indians into American society as land-owning farmers, the Dawes Act, as it was also known, allowed the government to divide communally held tribal land west of the Mississippi into parcels or allotments and assign them to individual Indian heads of families. Unassigned allotments were deemed “surplus” tribal land and opened up to non-Indian settlement. Over 90 million acres of tribal land was taken from American Indians under this legislation. 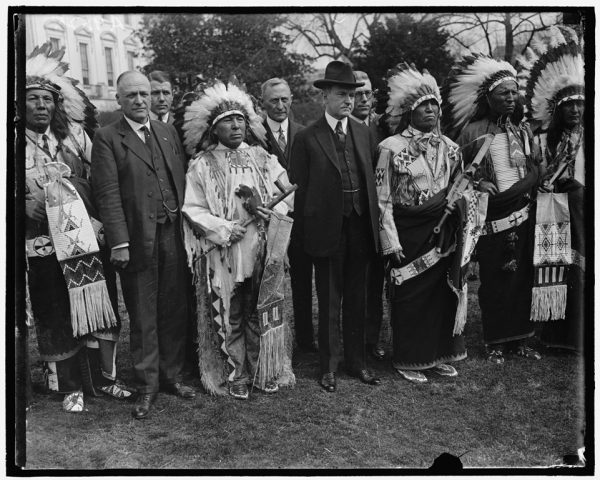 An undated photo of Coolidge with Indians in Washington, D.C. Photo courtesy of Library of Congress. The press, who followed Coolidge everywhere in South Dakota, made a great deal out of the Lakota’s ceremonial adoption of Coolidge but made no real mention of a more substantive discussion tribal leaders had with Coolidge about the U.S. government’s illegal seizure of the Black Hills, holy ground for the Lakota tribe. Federal officials had acknowledged the Black Hills as Lakota territory in the 1868 Fort Laramie Treaty, but after gold was discovered there, reclaimed the land in direct violation of the agreement. Lakota leaders submitted a claim for reparation in 1923. In 1927, during the president’s vacation, a coalition of Lakota leaders from different reservations traveled to the Summer White House to discuss the issue. Coolidge told them that he would report back to them after he returned to Washington. He sent the status report. Nothing came of it, and the Lakota leaders and activists continued to fight to reclaim their sacred Black Hills. As their struggle continued in the years to come, the political winds slowly began to shift. In 1928, the Institute for Government Research, a forerunner of the Brookings Institution, published The Problem of Indian Administration, frequently referred to as the Meriam Report, a damning 854-page study that found serious fault with the activities of the Indian Service and with conditions on the reservations. The Secretary of the Interior had commissioned the study during Coolidge’s presidency—but it was sociologist John Collier, a later commissioner of Indian Affairs under Franklin D. Roosevelt, who carried out many of the needed reforms. Collier’s key initiative was the Indian Reorganization Act of 1934, a serious attempt to support tribal self-government that ended the government’s devastating allotment policy and recognized Native Americans as being citizens of their Native nations, as well as the United States. He made no reference to the Lakota, nor any other indigenous peoples. It wasn’t until more than 50 years later—in 1980—that the U.S. Supreme Court ruled that the Lakota claim to the land was valid. Cécile R. Ganteaume is an associate curator at the Smithsonian’s National Museum of the American Indian in Washington, D.C., and a recipient of a Secretary of the Smithsonian’s Excellence in Research Award. With Paul Chaat Smith, she is curator of Americans, opening January 18, 2018. Her new book, Officially Indian: Symbols That Define the United States, will be published this fall to coincide with the opening of the exhibit.